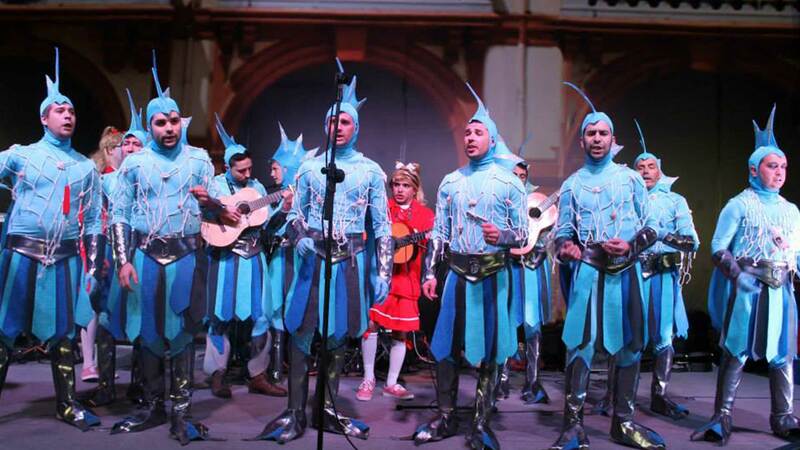 In the city of Almeria Carnivals are a tradition within the festival calendar where street musicians, parades, parodies and carnival groups with their costumes enliven the city in order to make enjoyment for the and a fun and colorful festive time. enjoy the festive atmosphere created by carnival lovers who work to enjoy a wonderful day full of light and color. The Carnival parade groups are common in this festive time because the streets are singing their musical repertoires, with listeners and carnival lovers. 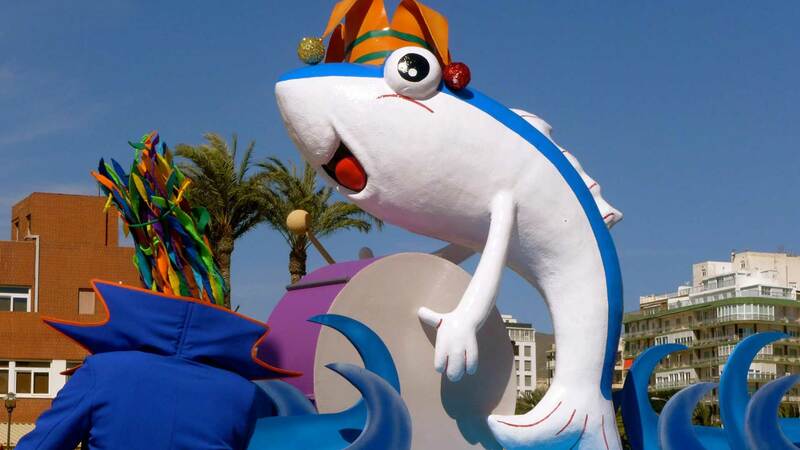 Finally, the almeriense Carnival ends with the famous burial of the sardine takes place on the beach of the Almadrabillas: first the route of the procession is through the streets of the historic centre, where it proceeds to the reading of Testament and then the burning of the sardine is realized, with performances by Carnival groups. Easter in Almeria organized as Via Crucis began in the early sixteenth century, starting from the City, but after the construction of the Cathedral in 1524 it was changed to start from this temple. 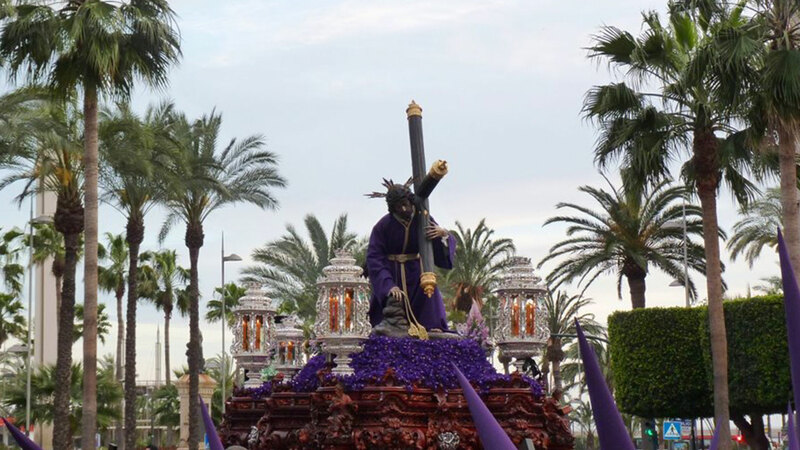 The Passion of Christ with sculptural groups forms a procession through the streets of Almería. This procession is called ‘penance station’ where each brotherhood steps accompanied by penitents and worshipers. From 1900 they relaunched several brotherhoods which had been dissolved in the nineteenth but during the Spanish Civil War much of the cofrade heritage had been destroyed. In the 1940s and 1950s some images were recovered and several brotherhoods were reorganized. 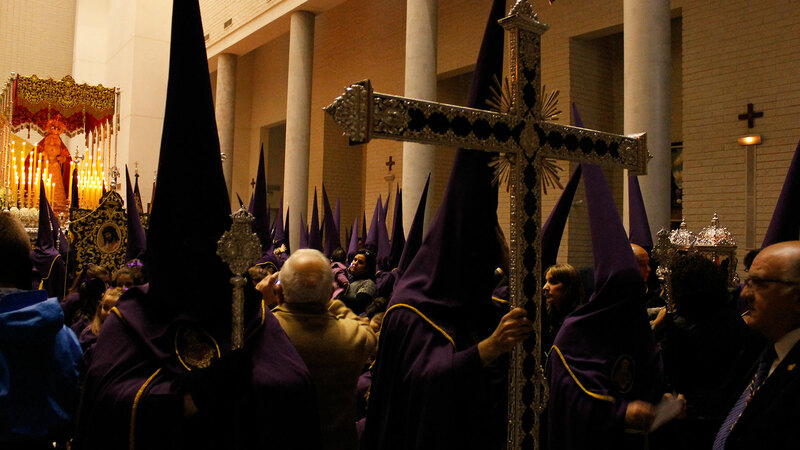 Easter Almeria experienced a boom from the 1980s processions included 11 brotherhoods – in 1983 and in 1984, 14. 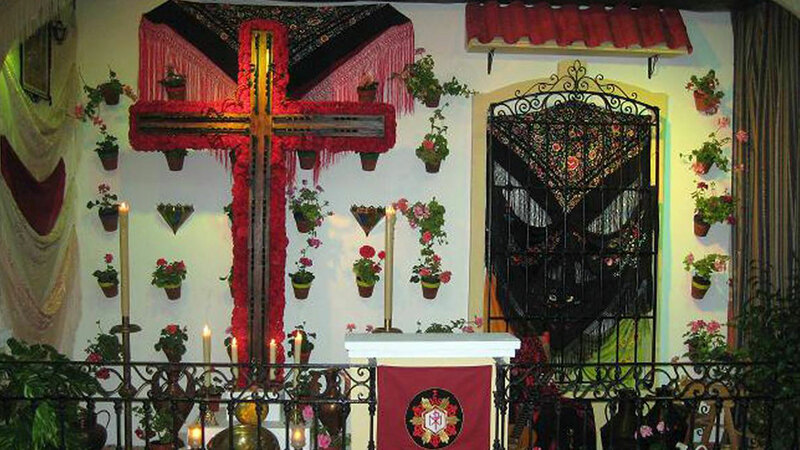 Currently Easter in Almeria has 25 brotherhoods being 21 in respect of Passion and 4 in respect of Gloria. The body responsible for the regulation of all brotherhoods of the city is run by the Association of Brotherhoods of the city of Almeria. Although the first brotherhoods were created during the sixteenth century, it was in the middle of the twentieth century when the vast majority of these were refounded. The official race runs along the Paseo de Almeria, although the Plaza de la Catedral is a point where almost every route is covered at some point in their itineraries. Easter is declared a National Tourist Interest in Andalusia. 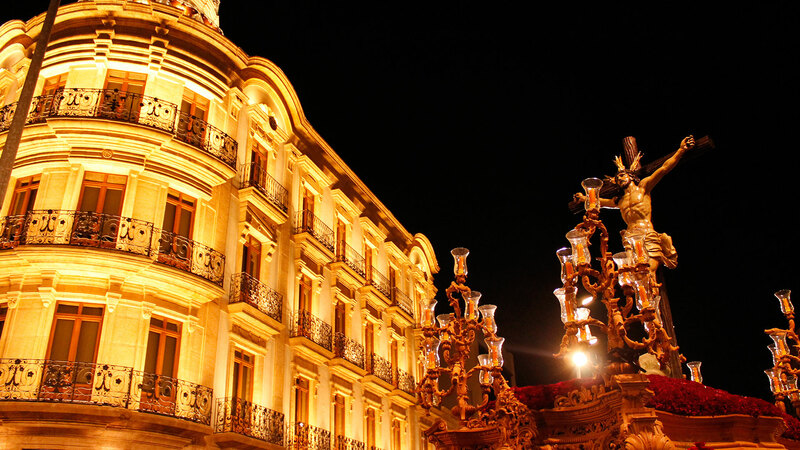 St. John’s Eve or Noche de San Juan is a deeply rooted festivity in Almeria. This festival coincides with other holidays of pagan origin (Litha) held at the solstice, on June 21 to welcome the arrival of summer in the northern hemisphere, whose main ritual is to light a fire in order to purify self beholding and also to give more power to the sun, which from those days was becoming weaker because the days are getting shorter until the winter solstice. Various events divided among the 16 beaches of the capital which we can enjoy a great show of castles of representative fireworks of the city, its culture and traditions that are made is known as “Espigón of Cats”. As tradition dictates, they can not miss the fires made with wood stacked on the beach, where it is a tradition to write on paper all the wishes we want as memories that want to erase in our lives and burn it in the fire to purify themselves. 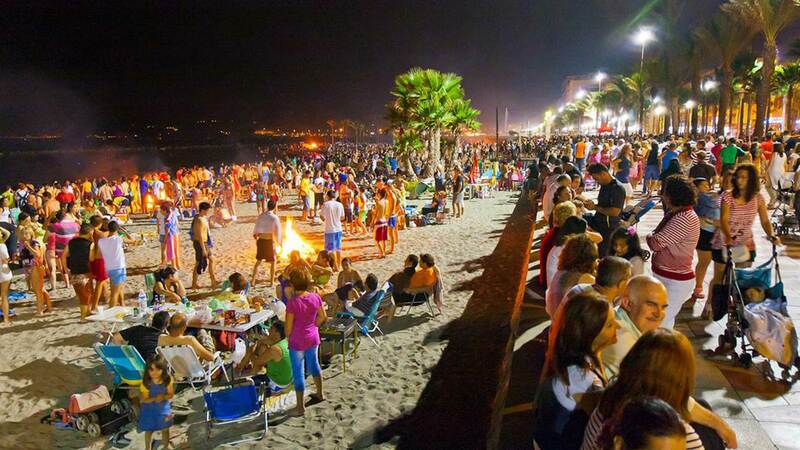 Overnight it is expected that San Juan attracts concerts on the beach. Along the beach they are common at Palmeral where people can enjoy a wide variety of music creating a perfect festive atmosphere allowing you to enjoy the sand, sea, the sea breeze, the heat of the fires and good company. It is common for citizens to gather on the beach with family and friends and settle in the sand on the beach to light their bonfires and light them throughout the night as sardines, meat barbecues and so on are prepared. Others prefer to walk, take something on the promenade, Toyo, Retamar or Costacabana. 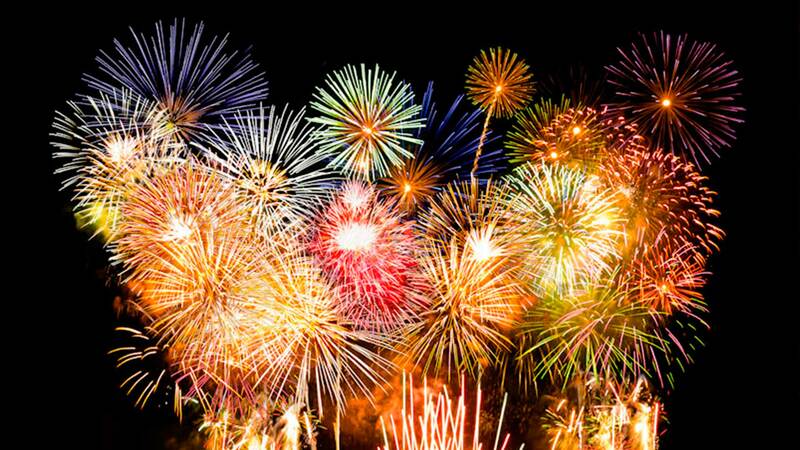 Once midnight arrives fireworks start which means it is time as tradition, says wet feet, hands and eyes to purify and good luck, although some brave choose to take a bath. 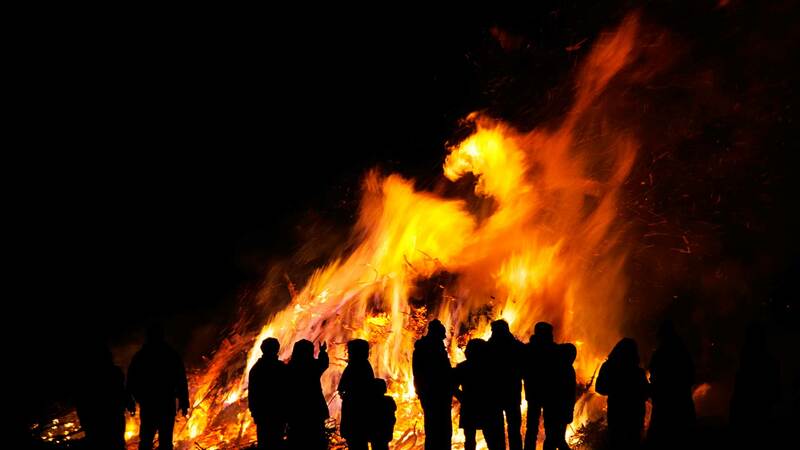 After jumping warm bonfires is common while still enjoying the night until dawn. 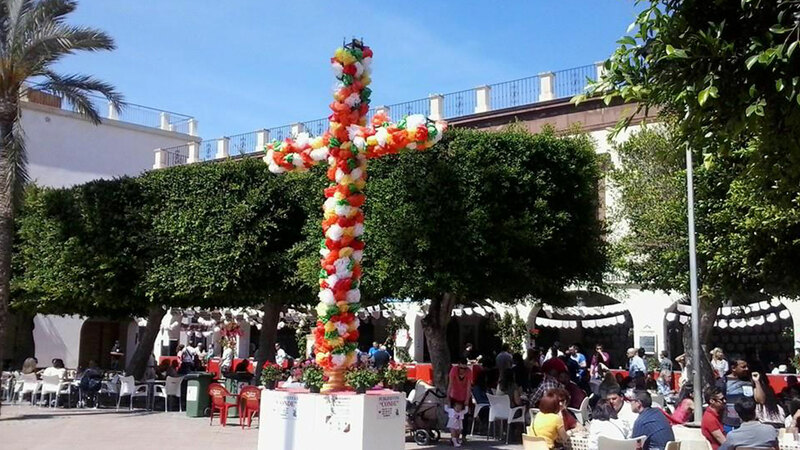 The festival of the Cruz de Mayo, known as the feast of the Mayos, held in Almeria during the first week of this month (May) and two corresponding weekends. This festival is influenced by the Romans from ancient pagan festivals and pre-Christian rites which is the average time of spring yielding and when nature cults are commemorated. According to tradition, a girl dressed in white and crowned with flowers was ” Maya ”, referring to the month of flowers. In this festive time it was very common for ritual dances, songs and recitations in gratitude for the arrival of spring. Participants are part of a contest where they receive a prize for Best Cross. 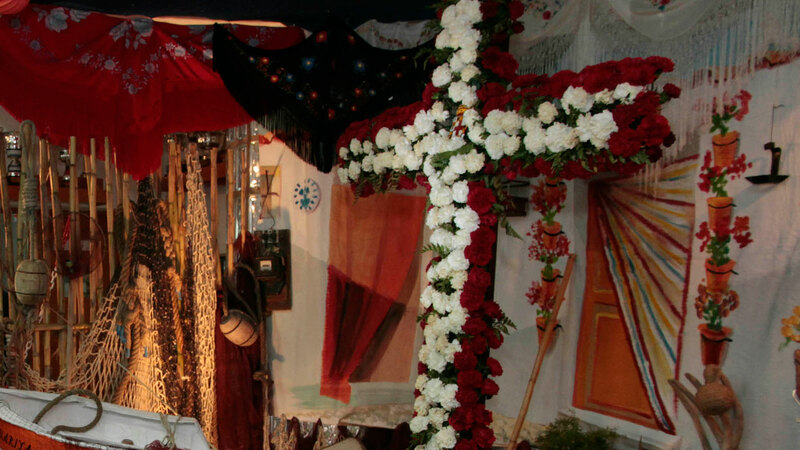 It is common for people to meet at the points where the May Crosses are placed in order to visit them since in the precincts where they are placed those crosses adapt their facilities so that all visitors can enjoy a festive atmosphere in the company of family and friends and where you can taste typical dishes like gurullos, wheat, crumbs, sweets, etc. The Fair and Festival of Almeria, is held from the second half of August and is in honor of the patron saint of Almería, the Virgen del Mar. 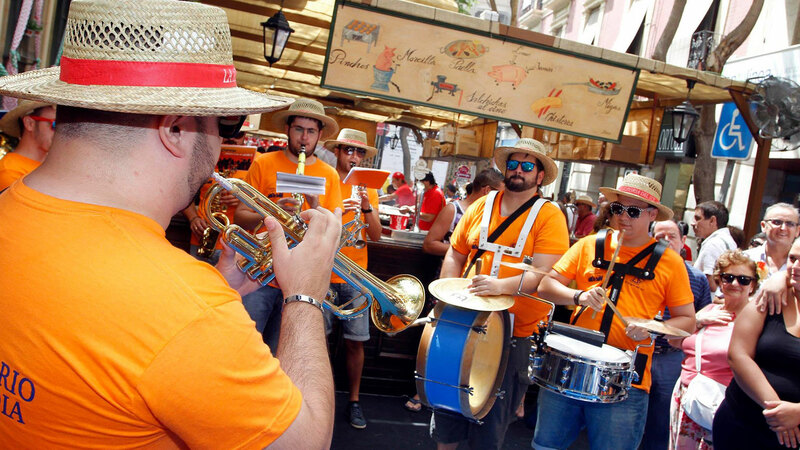 For several days various activities: sports, bullfights, Fair Noon (which every year is taking more energy) with the installation of bars in the city centre, and also equestrian activities and popular Fair Pottery. 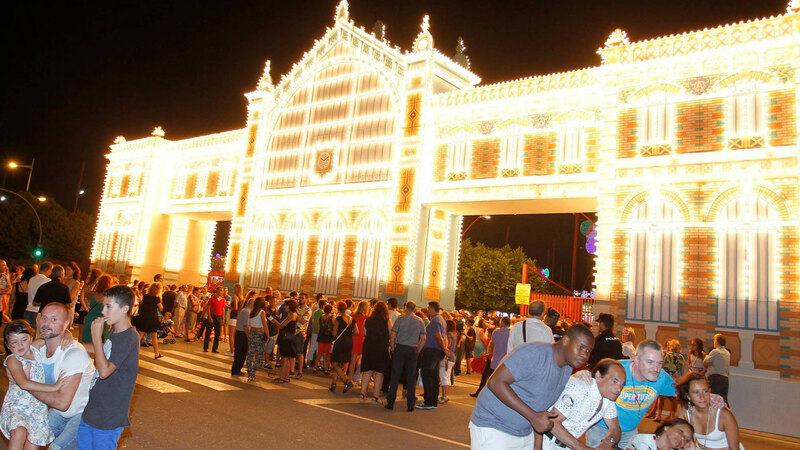 Night Fair also enjoys great acceptance, with many booths, and where dancing and animation are the protagonists. 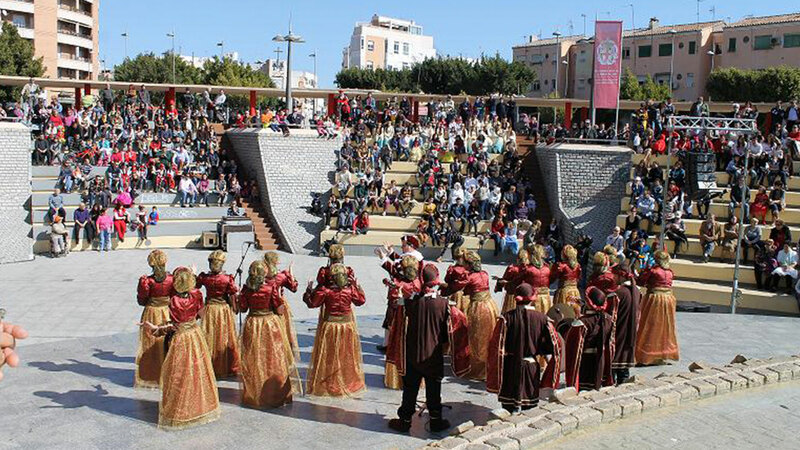 On 26 December, held in Almeria on the Pennant, Boxing Day. The Mayor of Almería chairs the institutional act of homage to the City of Almería Pendón commemorating the capture of the city by the Catholic Monarchs and its annexation to the Crown of Castile, on 26 December 1489. The events mark a long tradition, started with the firing of regulatory salutes in honor of the flag that marked the entrance of the Christian forces in Almeria during the long process of Reconquista, and by the mayor Tremolada as he cheers three times to welcome the Catholic monarchs and the Integration of Peoples to Andalucia, Spain. The Corporation, civil and military officials and guests to this act are at the arcades of the Plaza Vieja from there to witness the swearing request by the mayor the youngest councilman, who is in charge of carrying the flag. The councilor is asked three times to take the oath, descending the balcony of the Pendón while the Band plays the National Anthem. Chaired by the mayor, the party heads to the Cathedral where traditional Thanksgiving prologue of the short procession culminating again in the Cathedral for a solemn Mass presided over and celebrated by the Bishop. Once he finished the religious ceremony, the entourage of attendees also head to the Plaza Vieja, where the gesture is renewed three times by the waving of the flag by the mayor of the city. The second Sunday of the year the pilgrimage Torregarcía is celebrated, where the Virgin del Mar, appeared as patroness of Almería, in the year 1502 with a coastal watchtower. There exists a hermitage where the image is worshiped. The population pilgrimage accompanies the image from the temple in the historic centre, the Basilica of the Virgen del Mar, to this beach near the district of Retamar. 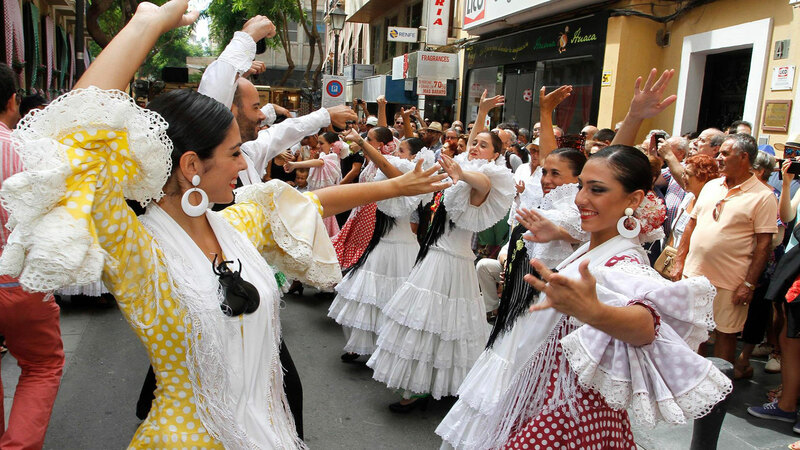 There are usually traditional foods such as rice and migas, people ride horses, performances by folk groups, and ends with a Mass by the Bishop of Almeria. The Virgen del Carmen. On 16 July, the district Pescadería worships his Virgin, patron saint of all fishermen. There is a sea procession where he embarks to the Virgen del Carmen that is canonically located in the Church of San Roque. It leaves from the fishing port of Almeria. The app from the official city guide.